Looking for deals in Palermo? Featuring a terrace and fitness center, Camplus Guest Palermo offers modern air-conditioned rooms in Palermo, 984 feet from Palazzo dei Normanni. Clean, spacious. Great breakfast and plenty of parking!! A 9-minute walk from Palermo Cathedral, Palazzo Natoli Boutique Hotel is located in Palermo and provides rooms with free WiFi. Newly renovated hotel and stylishly done. The staff were very helpful and friendly. We loved the location as it was handy to all the sights. Located in Palermo, 1.1 miles from Palazzo dei Normanni, Albergo Cavour provides air-conditioned rooms and a shared lounge. This 1-star hotel offers a 24-hour front desk, room service and free WiFi. The staff is incredibly nice and friendly. They give you nice tipps is you ask them anything. The design of the hotel is very vintage, we loved the decoration. It felt as if we were timetravelling. The location of the hotel is also perfect, you can reach the historical areas, restaurants within 20 min. Set in the historical center of Palermo, this colorful 2-star hotel offers air-conditioned rooms with free Wi-Fi and a private bathroom. Excellent central location in Palermo. Giuseppe - our Host - was welcoming and very helpful. Being on the 6th floor was a bonus as it removed you from the hustle and bustle of the streets below. A lovely haven for the one night I was there. Set in the Ruggero Settimo district in Palermo, 0.6 mi from Palermo Cathedral, Bio Hotel Palermo features free WiFi access. We missed the information that checkout was at 1030. Staff did a good job explaining. Giardino Inglese is in a late 19th century building in north Palermo, around one mile from Palermo Train Station and the cathedral. Location, beautiful park outside, great shopping area, quiet, staff very good, especially Francisco. Hotel Concordia is set in Palermo center, less than a 5-minute walk from Palermo Station. Staff is wonderful, very clean! Located close to train and bus station in central Palermo. The luxury Grand Hotel Wagner is full of old-world charm. This prestigious hotel set in the heart of Palermo, near the Politeama Theater, the pedestrian area and many top-class shops and restaurants. The facilities were exceptionally beautiful. 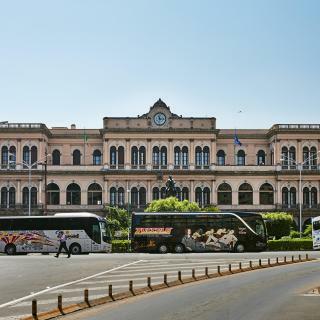 Hotel Garibaldi is right opposite Palermo's famous Politeama Theater, and offers stylish rooms with air conditioning and satellite TV with Sky channels. Free WiFi throughout is provided. Everything was fine in the Hotel Garibaldi during our visit. Hospitality Hotel is set in Palermo, a 10-minute walk from the central Via Roma. This property features free WiFi, an on-site bar, and a shared garden area is also available. This is a superb hotel and we really enjoyed our stay. This charming hotel is ideally located in the heart of Palermo, between historical buildings and right in front of the Teatro Massimo, one of the most important European theaters. Every thing, kindness, helpful. Located just 328 feet from Palermo's Politeama Theater, Hotel Vecchio Borgo offers free Wi-Fi and a 24-hour reception. Rooms have a satellite flat-screen TV. This location is wonderful and quality price ratio is unbeatable. The elegant Hotel Posta is a former noble mansion located in the historic center of Palermo, just 984 feet from the Massimo Theater and 0.6 mi from Palermo Cathedral. Great location. Walking distance to local tourist areas and restaurants. Artemisia Palace Hotel is an early 20th-century building close to the Politeama Theater. Palermo historical center is 15 minutes' walk away and you will be close to the harbor. The room was spacious and well-appointed with a huge wrap-around balcony. Hotel Porta Felice is in central Palermo, near the Botanical Gardens, and the seaside promenade. A rich breakfast is served on the rooftop terrace. Rooms and suites have an LCD TV and free Wi-Fi. Great location, very very large room! 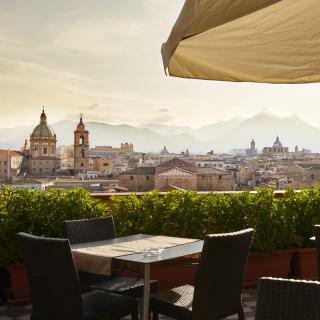 Situated in a completely refurbished classical building located in the historic and business center of Palermo, this luxurious hotel is within walking distance from the main theaters, monumental... The staff is wonderful. Absolutely the best. Quinto Canto Hotel & Spa is set right in the middle of Palermo’s historic center, at the Quattro Canti crossroads. Rooms are spacious and stylish. Clean rooms. Hospitable staff. Great location. Featuring a terrace and set in the heart of Palermo, Hotel Plaza Opéra is just 492 feet from the Politeama Theater. The rooms offer elegant parquet floors and a flat-screen satellite TV. Nice hotel with very nice staff. Comfortable room but no view. Which hotels in Palermo are good for couples? These hotels in Palermo are highly rated by couples: B&B Isola Bella, Alma Hotel, and Ariston Hotel & BB. What are the best hotels in Palermo near Piazza Politeama? Some of the best hotels in Palermo near Piazza Politeama include Casa Ricasoli 41, B&B Attico 33 and B&B Massimo Inn. Which hotels in Palermo have nice views? 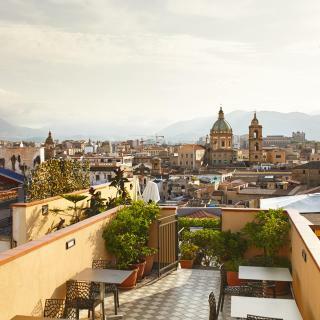 Hotel Bel 3, Albergo Cavour, and NH Palermo got great room view-related reviews from travelers in Palermo. 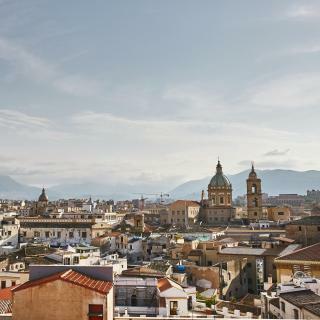 Which neighborhood is the best one to stay at in Palermo? La Kalsa, Castellammare Vucciria, and Albergaria are popular with other travelers visiting Palermo. 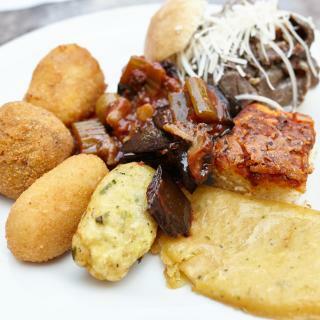 Which hotels in Palermo offer an especially good breakfast? 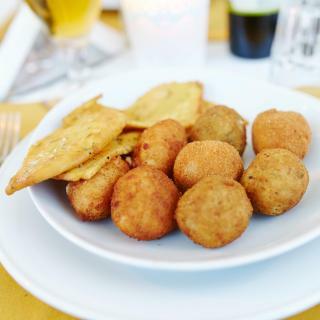 For hotels in Palermo that serve highly-rated breakfasts, try Alma Hotel, Hotel Principe di Lampedusa, and Artemisia Palace Hotel. What are the best hotels in Palermo near Falcone-Borsellino Airport? Travelers who stayed in Palermo near Falcone-Borsellino Airport (PMO) have said good things about Magaggiari Hotel Resort, Hotel Il Pirata, and Florio Park Hotel. Which hotels are the best ones to stay at in Palermo? Camplus Guest Palermo, Alma Hotel, and Ariston Hotel & BB are some of the popular hotels in Palermo. Which hotels in Palermo are good for families? Many families visiting Palermo loved staying at Alma Hotel, Albergo Cavour, and Ariston Hotel & BB. How much does it cost to stay in a hotel in Palermo? On average, 3-star hotels in Palermo cost $63 per night, and 4-star hotels in Palermo are $85 per night. If you're looking for something really special, a 5-star hotel in Palermo can be found for $241 per night, on average (based on Booking.com prices). How much is a hotel in Palermo for tonight? On average, it costs $61 per night to book a 3-star hotel in Palermo for tonight. You'll pay around $113 if you choose to stay in a 4-star hotel tonight, while a 5-star hotel in Palermo will cost around $174, on average (based on Booking.com prices). How much is a hotel in Palermo for this weekend? The average price per night for a 3-star hotel in Palermo this weekend is $127 or, for a 4-star hotel, $226. Looking for something even fancier? 5-star hotels in Palermo for this weekend cost around $347 per night, on average (based on Booking.com prices). Edgy and eclectic, Palermo is a symbol of all that Sicily stands for. 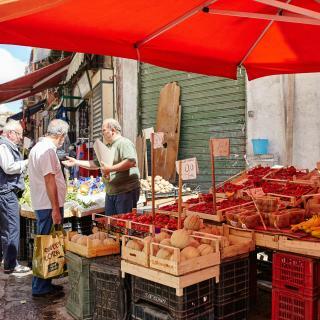 From buzzing Vespas to the bustling Vucciria market, it simply brims with life. Wonderful Palermo Cathedral glows radiantly in the Mediterranean sun. Nearby is the city’s last Sicilian Puppet Theater, and across the street is a palm-filled park housing Roman mosaics, though the best are in the archeological museum. At one end is the Norman Palace, a government building home to the fabulous Cappella Palatina, whose gold mosaics are absolutely breathtaking. Equally magnificent are the gold mosaics lining the 12th-century Monreale Cathedral on the city’s outskirts. Wander the cloisters and note the varying columns and capitals – each pair is different. Palermo also has fascinating churches: 2 of the oldest are 12th-century San Giovanni degli Eremeti and San Cataldo, each with red, Islamic-style domes. Gesú Church has an incredible Sicilian Baroque interior, while La Martorana’s frescoes are awe-inspiring. A street away is Quattro Canti, an intersection with a fountain in each corner. Other attractions include the round Teatro Massimo, Mondello beach and Monte Pellegrino mountain overlooking the sea. You get fabulous views of this picnic spot as you fly into Palermo Airport before heading to your Booking.com accommodations. Palermo was so much better than we anticipated from the guide books. Liked the architecture, interesting streets, markets, cathedrals, monuments. The old town was so interesting...new experience on each corner. Didn’t allow enough time. The city si wonderfull and very amusing The Monreale Cathedral, outstanding Sometimos we felt we were being charged extra prices I Cucci restaurante was a disaster and Aboriginale café, after office, was great. Getting around Palermo si easy Walking around the city, or by the sea, was very funny and amusing. Excellent the cannoli at Cannolissimo, Vittorio Emannuelle ave.
We did alot of walking. We did alot of walking. Everything was in walking distance however we took a horse and buggy ride to some of the attractions. The churches were beautiful. The people tried to help with the language barrier. Shopping was Great The worse thing was trash in the street. Some people don't care about how they live, however that is anywhere. I personally didnlt like this city. I personally didnlt like this city. Its so dirty, there were too many garbages around. Literally every step you take you have to becareful not to step on some garbage or rotten food. So scary to walk around the streets at night. It was so unpleasant. We only went to palermo just to visit small cities nearby palermo. I would never visit palermo again. Be open minded, Palermo is a city. Be open minded, Palermo is a city. It was great to do everything on foot. We really enjoyed the colorful Ballaro Market. A day or two was plenty to explore through Palermo. We used it as a base to see the western half of Sicily by car. Our favorites were Erice, Trapani, Museo dei Saline, Marsala ( book your tasting in advance ), Valley of the Temples, San Leone and the Villa Romana del Casale. I would definitely stay outside of the city and take a bus or taxi in for the day. Seeing the Cathedral was lovely. We took a city bus to Monreale and enjoyed the town. Be prepared that the bus is extremely crowded. City needs to run buses more often. The house has the normal issues of a standard household but all of them are totally minimized by the warm and friendly attitude of the host. Very polite and correct, with perfect sense of communication, ready to help for any kind of question. Proposed us the best restaurant we have visited in Sicily. She made us feel and see the best traits of the true Italian and Sicilian character. Thanks a lot for the human touch! The location is very suitable for exploring the center of Palermo. This is a very old 5 star hotel. Must have been something in its day. Now it’s a white elephant. But I like it all the same, this enchanted ruin. Free parking? Hell yeah. Breakfast included? Yes it is! And it wasn’t even half bad. Spacious rooms? Yes they are. Shoe shine machine in the hallway? You bet. It’s Sicily... having shiny shoes is more important than clean drinking water. Phillips radio built into the bed? Check. What a trip down the memory lane! Best location in Palermo for access to everything Palermo has to offer. Stefania and Stefania were both fantastic hosts and exemplify why Palerminos and minas are great people! Sicily is one of the most beautiful islands on earth and if you go to Palermo Palco is a top spot to stay! Thanks to Stefania for all her help and guidance! Molto buona for sure!! The rooms are how they look on the website so no need to worry you just come Sicilia and enjoy! This little bed and breakfast was a great escape in Palermo. The city is a little rough so it was amazing to enjoy our stay in this brand new, super clean little hotel. Breakfast every morning was amazing. Fresh coffee and pastry and other treats. The staff was amazing. Really welcoming and accommodating. Were able to check us in really late and were really flexible. We loved everything about our stay would definitely recommend and come back!!! We liked the fact that we were a little way out of the city. The views from Room 209 are amazing. The hotel staff are very helpful, professional and generous with their time. In particular we would like to thank Santo for getting us safely to and from Palermo through the crazy traffic! And Pierro who was always smiling, pleasant and helpful at giving us good suggestions on what to do and see in Palermo. It says B+B but it is more boutique hotel with a nice breakfast. The rooms were clean and well appointed. Great common spaces. Rodi, the host, was very welcoming; had many recommendations; and booked us dinners. It is a bit hard to find. They booked us a car from the airport which brought us right there. Great location in old town. Very safe and close to the sights. This is probably one of the best B&B in Sicily. The location is perfect, right in the middle of the historic part of Palermo, close to the best restaurants and all the main attractions. It is also close to train and bus station with links to the airport. The room was very comfortable and clean, and the breakfast was really good, especially the pistachio croissants! Great staff and fantastic breakfasts. Right next to the historic centre and attractions so wonderful location. Rooms kept spotless and towels changed daily. Great deck room, a few steps up to the room, as no lift, but didn't bother us. Would recommend it to anybody visiting Palermo and after a quirky boutique hotel. Wonderful, comfortable and clean hotel in the heart of Palermo. A former palace, it is a real period piece. Wonderful breakfast buffet with wide selection of quality hot and cold foods. Giampero and all the staff were exceptionally friendly and helpful and made our stay in Palermo a memorable experience. Palermo is a great city. The best you can get in Italy in my experience. The place is super comfortable, the staff is very welcoming and willing to help. Illenia and Alessio are just this couple of sicilians that you are willing to meet when you go to Sicily. All in all is just the place to go in Palermo. This property is in a perfect location for seeing Palermo. Christina is a perfect host , warm and very knowledgeable .. This was our first stop in Sicily and she made us feel so welcome .She had great suggestions . Her place is a quiet refuge in a busy city , makes you feel like a local .. Excellent ! Perfect location, easy to find and close to all attractions in Palermo center. Beautiful, luxury, clean and well furnished rooms. Amazing, friendly and professional staff. Incredible breakfast. One of the best accomodation for the very fair price. Many thanks Palermo Gallery. Everything! A beautiful boutique hotel in Palermo city center. We arrived quite late because of the delay of flight. But they still waited us and guide us to park to the garage which is very close to the hotel. Breakfast is nice, we love it. We stayed here for 3 night and it’s a great location close to lots of bars, restaurants and shops. The owner Marcello was really nice and gave us lots of info and tips on what to do in Palermo and other locations in Sicily. Heartwarming, Hospitality even they don't speak English. Room is cleanliness. Breakfast is enough choice. Drain is the best in B&Bs I stayed in Italy. We loved Cannatella’s Mansion, and Giancarlo was very nice & accommodating. Breakfast was good including the best cappuccino we had anywhere in Italy. The host is really nice and helpful with tips about Palermo and about Sicily in general, the location is amazing, we had great time. Nice place to stay in Palermo-Sicily. Near to Palermo train and bus station.